Last week, Jagex offered us the opportunity to interview the developers behind the upcoming Clan Citadels update, and answer some of our burning questions about this interesting feature! Today we have received a combined interview consisting of questions from all fansites who participated, as well as a piece of concept art related to Clan Citadels! Like previous interviews, Forum Staff, Distinguished Members and Chat Mods contributed questions to this interview - many thanks goes to those who submitted questions, and a huge thanks goes to the developers who answered these questions! Without further ado, here is the Clan Citadels interview -- enjoy! The citadels will provide the players with yet another XP boost but one that is controlled by players. Aren't you afraid that this will be abused by creating pyramid schemes? Only those that have actually gathered resources will get the bonus ring and only for those skills that are currently in the citadel. There is no control by other players for this situation and it can't be abused in the way that has been suggested. What if some of the clanfounders become f2p, e.g. 2-weeks-break due to holiday, and the number of clanmembers drops below 5? Will the citadell be accessible for the remaining ones? Will it vanish completely? Or appear again in its last shape as soon as there are 5 clanmembers again? The citadel won't be accessible if there are less than 5 members in the clan. It won't vanish though, if it takes a while for there to be 5 members again the citadel will be dilapidated but the features and tier level will be the same. For which skills will the clan ring be of use? The ring can be used for all of the skills mentioned in the dev blog, so; woodcutting, mining, firemaking, smithing, crafting, summoning and cooking. It will depend on what skill plots the clan has though so if a clan only has the woodcutting and mining plots then they will be the skills that can be influenced by the ring. As we read in your news article, you need to work together for this update, isn't it possible to do it on your own? No, the way the citadels works means that the more players involved the more efficient the activity will become. The citadels aren't meant to take away from RuneScape. We want players to spend time enjoying the citadels but it shouldn't be all that they do. You also said in your news article that you'll get the materials needed to build your realm, does this mean you don't have to invest any of your own items? Yes, all of the items needed to improve your citadel can be found within the citadel. Are the Clan citadels going to look just like the art in the news article? They are amazing. If you want to get more of an idea about how they will look you should check out the citadel video. How big will these Citadels be? Will the size be similar to a city like Falador or will it be something like the PoH's? They are huge, similar in size to Varrock. For more of an idea about the size check out the Citadels video. In the Behind the Scenes, you mention choosing from 4 possible layouts and between night and day when setting up the citadel. Once chosen, is this set in stone, or is it able to be changed in the future (if not the layout, then at least the time of day)? You will be able to change the layout and the day/night visual effects each week. It won't cost any resources to do this. Approximately how large would the Citadals span? If their sizes change between tiers what are the lowest and largest sizes? A citadel will be about the same size of Varrock. Although the size varies between the tiers none of them will appear small. For more of an idea about the size check out the Citadels video. Will Citadels accomodate most skills (excluding Dungeoneering of course)? The skills involved will be; woodcutting, mining, firemaking, smithing, crafting, summoning and cooking. The combat skills can also be used in the battlefield. Will we be able to invite guests to 'visit' the Citadel? Yes, the admin in the clan will be able to change the settings to allow visitors to enter the citadel. Will the design of the Citadel influence the design of the clan vexillum or vice versa? The clan vexillum will influence the design of the citadel as all flags will display the clan logos. 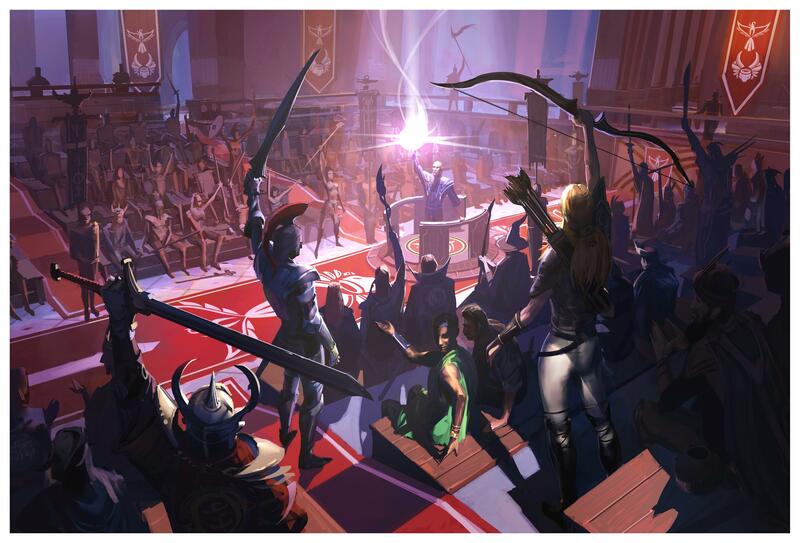 Will the clan citadels offer any activities of skills or combat for the clan members to participate in? Other than the resource gathering there will also be the battlefields which can involve the combat skills. The range of possibilities in the battlefield is huge, you should have a lot of fun playing around with it. Will you be able to visit another clan's Citadel if you are in a different clan at that time? Will this be linked to the object that is being built at the Clan Camp? Yes, more information about this will be released soon. Make sure to keep an eye out. Why a Clan Citadel in the sky instead of just a Clan House as most were thinking of? The real estate in RuneScape is quite expensive and there isn't too much room for large developments like this. The sky is the way to go and it was convenient as the citadels were already there. Will a combat oriented clan's Citadel look different than a skill oriented clan's? The look of each citadel well vary from clan to clan, both types of clans will be picking from the same options and skill plots though. The battlefield is likely to look very different depending on the focus of the clan. We look forward to seeing what you all come up with. Will you be able to have a noticeboard posted in your Clan Citadel? Yes, there will be a noticeboard in the citadels. Will your Citadel be able to have a Prayer altar? Yes, there will be an altar available at one of the higher tiers. If a higher tier is built, will a person need to do what the people who built it did in order to access that floor? No, everyone in the clan will be able to access the different areas even if they haven't contributed to that area. Will the Citadel have a "Throne Room" for those clans that have a leader, as opposed to equality? There isn't a throne room but there is an area for the clan to meet which would fit well with both types of clans. Will you be able to make a dungeon to train your clan in against monsters? You will be able to make dungeon type rooms in the battlefield but sadly the monsters are afraid of heights and so won't be there for you to battle. There are going to be NPCs to battle however. Will there be any NPC's inside the Citadel? Yes, there will be guards and NPC's available in the battlefield as well. Will clan owners be able to set access in regards to construction and design of the citadel? Yes, there will be different settings to choose from in this area. How much work (measured in hours) are you going to require from players to upgrade their citadels? Will it be tens, hundreds or even thousands of hours to upgrade the clan's citadel to the über tier? Each week a player will need to put in about 20 minutes to help with the upkeep of the citadel, upgrades are an addition to this and will require more time. The more players involved the better though. Will clans be allowed to siege rival citadels? It isn't something possible at this time although you will be able to visit rival citadels. The idea of battles between different clans in their citadels is an idea that has been passed along. Will we get to decide where we can put our clan citadel? I know it will probably be in the sky, but can we position it where we would like? No, you won't be able to decide where you can put your citadel. Also, will we be able to look down from them? Yes but you won't be able to see the ground. Will Non-paying members be able to access the clan Citadel of the clan they are in, in any form (i.e. restricted activities, specific areas, or full access)? No, this is a members-only feature so only those members who are part of a clan with a citadel can enter. Can Guests come to a Clan's Citadel, and if so what ways will a clan be able to control those who are allowed in (either allowing everyone or no one in, allowing people in on invite, only those currently in the clan's chat as a guest, friends of members of the clan, etc.)? Also, if guests are allowed into Clan Citadels will it be possible to restrict which portions of the Citadel they can go to? Yes they can as it'll be a setting to allow guests in or not and then clans will have the ability to set what sections of the Clan Citadel that guests can go into or the whole place. What will happen to the Citadel if a clan no longer has any Paying members? The same that would happen if there were still members in a clan but they weren't keeping up with their upkeep! Firstly the Citadel would start to dilapidate and if still not worked on it would then start to de-tier all the way down to tier 1. Will unmaintained citadels degrade and lose the tiers of advancement you mentioned, or are those upgrades permanent? Unmaintained citadels will degrade eventually - one week of neglect and your citadel will become dilapidated, (looking ruined, and your plots will act like the tier below) a second week of neglect and your citadel downgrades a tier. How much is the Construction skill involved, and are there features that aren't purely decorative that require levels higher than 75 in that skill? How hard will it be to upgrade a citadels tier? Will it just be a huge flat fee that might make it harder for smaller clans to compete for new members against bigger ones or will there be some way to vary the cost of upgrading it based on the number of members in a particulare clan? It depends on what you mean by hard, of course as each tier is upgraded it will be increasingly difficult to gather the correct amount of resources but it should never feel taxing to the players involved. There is a flat 'fee' for each tier and upgrade. Does it cost gp, materials, or anything to upgrade them? It will not cost anything from outside of Citadels except for the time spent gathering resources inside of the Citadel at the skilling plots. Will max total level players be able to temporarily join a clan just so that they can build something they would normally be unable to? No, there is nothing in the citadels that is level locked. Will five players be required to maintain the citadel? For tier 1 citadels yes, for the larger citadel tiers it will require increasingly more people from your clan to help maintain your citadels. Also I think as asked before, can you put together a dungeoneering party there? No, you will not be able to put together a Dungeoneering party at a Clan Citadel. Will we be able to have our own cabbage patches on the citadel? Sadly not! I don't think that the cabbages enjoy being that high up in the sky. Also, how much time will roughtly need to be spent by everyone (suppose everyone has all skills 80) for the weekly upkeep? It's averaged out to be around 20mins per player in the clan. Obviously if less people decide to help with the upkeep then there will be more time required from the others. Can we visit other clan's citadels? I heard the word "upkeep" being used. Does this mean out citadels will fall into disrepair if kept unattended for too long? That's right, just like any other grand building in the world it will require a bit of work to ensure that it stays as pristine and good looking as it does. Why are you making it require over 7 weeks to get a tier 7 citadel? It's going to take a lot longer than 7 weeks to hit tier 7. As they say "Rome wasn't built in a day". We want a Tier 7 citadel to be an achievement in itself - it won't only take time, but planning and organisation to upgrade to a tier 7 citadel. The Jagex Graphics Team has also provided a neat piece of fan art, apparently a sneak-peak of what the loading screen will look like once Clan Citadels have been released.